Susan Reed has a Bachelor of Science in nutrition and has worked for eighteen years as a nutritionist and hospital dietician. She worked in nutritional research for several years. She became interested in higher consciousness and spent four years in an enlightenment and study course. She then met a man named Brian, who revealed himself to be a reptilian host. This catapulted her into the secret reptilian involvement on the planet. I have concluded because of these experiences that Brian is a combination of a reptilian spirit controlling a human spirit in a single human body and Brian has described this. They have body snatched a human but they keep the human spirit there. A worker in the Dulce underground base named Thomas 4 confirms this when he states " they know how to separate the bioplasmic body from the physical body to place an alien entity life-force matrix within a human body after removing the "soul" life-force matrix of the human. The life-force matrix would I assume be the spirit. I also have evidence that the reptilian and human spirits are technically joined at the mental level. Brian has in fact told me after the event "I'm the reptilian and I just use him (the human), I ain't no human, well he's part of me, but he ain't me, you know what I mean" and "they don't exactly coexist it's more like the alien has overwhelmed the human, the reptilian is now in the drivers seat." and by this I assume he means the mind of the reptilian is in control. I deduce that the human spirit is needed to coordinating the body which the reptilian can't do. How can this be possible? - With Spirit technology which they have. The author of this book was reported to have drowned off a beach in Nassau, Bahamas in October of 2009. Her true name was Jeannie Gospell. She was likely murdered. After you read this book, you will understand why. I will be gradually editing the English grammar in this posting (as time allows) to make it easier to read and understand what the author is trying to explain (currently, I've edited up to section 2.1). 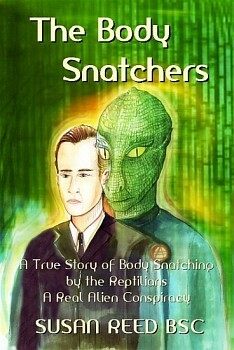 The original, unedited version is found at this link (http://educate-yourself.org/vcd/bodysnatchersSusanReed.shtml). This book is extremely important. It offers many insights into the psychology, methodology, motivations, and long term goals of the reptilian aliens who are engaged in an agenda that is threatening -in the extreme- the continued existence of the human race on this planet. As humans, we need to confront this threat and DEAL with it (as burying your head in the sand is NOT going to solve anything). If we don't stop this reptilian infiltration and takeover, our very existence as a race of people, living on our own mother planet, is in peril. This agenda must be recognized, and it must be exposed, and it must be stopped. It should be noted, however, that the author of this book is limited in her understanding of higher metephysical principles. She's perplexed by the apparent conundrum that reptilians think and behave with such evil intent and malice, yet they operate in in a "higher" dimensional plane. The author equates "higher" dimensional planes with higher spiritual advancement. It doesn't exactly work that way. Yes, when you go above a certain threshold of vibration, evil thinkers and evil doers cannot exist, but the fourth and fifth dimensions are not strictly bound by that limitation.